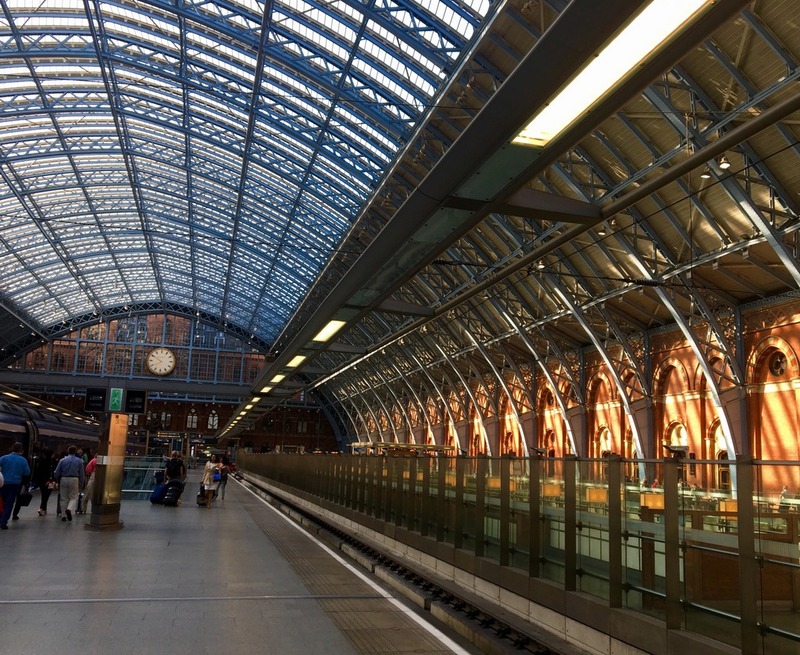 The joy of the Eurostar was apparent as I embarked on a wonderfully stress-free journey via Kings Cross St Pancras to Brussels, coffee and book in hand. The change at Brussels was remarkably effortless on to the local train network with a further 30-minute journey to Ghent. 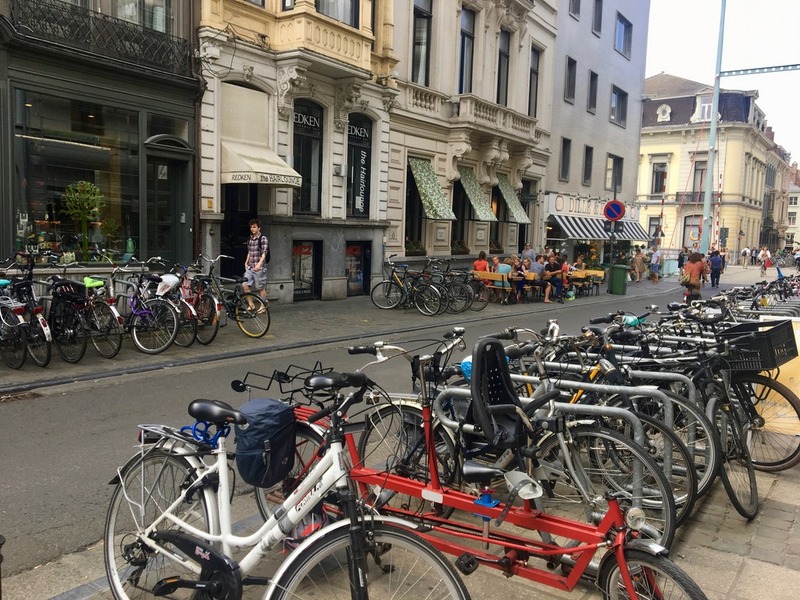 It’s such a lovely way to travel and so much less hassle than navigating airport security and check-ins, the entire journey from leaving home in West London to arriving in the centre of Ghent took less than five hours. 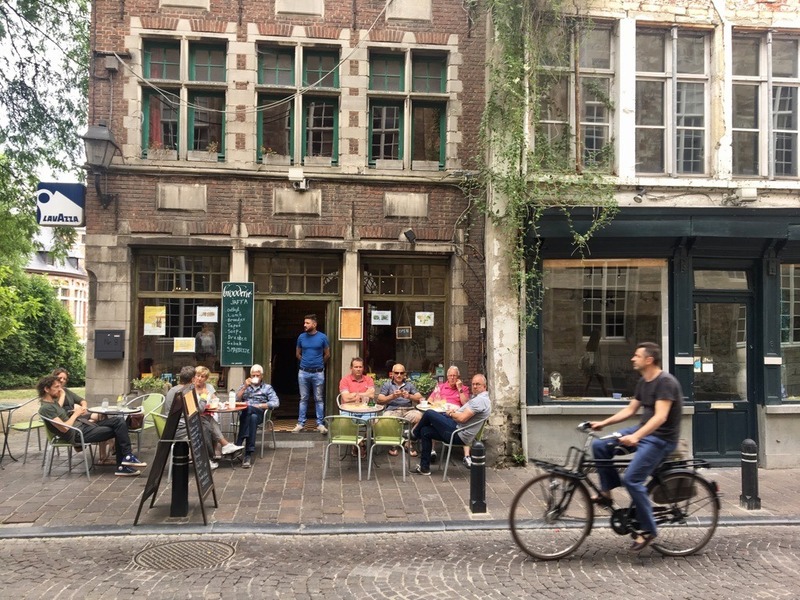 My trip to Ghent had two main purposes, firstly to discover the joys of this lesser known Belgian city, but also to experience their huge commitment to eating excellent vegetarian food, which I talked about in my first post. It was a hot and humid day in Belgium, a sweltering 28 degrees, so I was pleased to be able to drop my bag at my room as soon as I arrived. I was staying at Chambre Plus, which provide holiday rooms right in the centre of Ghent. All the rooms are individually themed and beautifully presented. I was staying in the Congo room, which as its name suggests, creates an on safari, colonial feel. 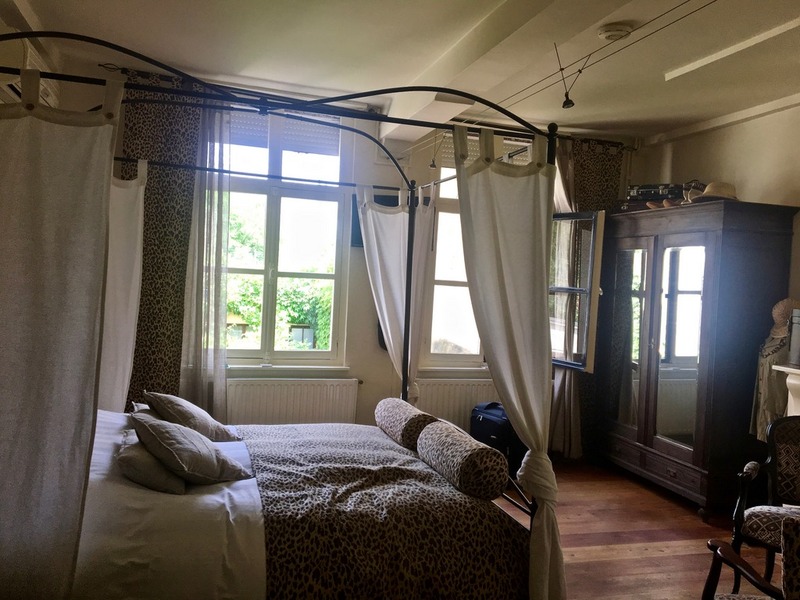 It was airy and spacious and the bed, which was covered in an on theme leopard skin throw, was very comfortable. 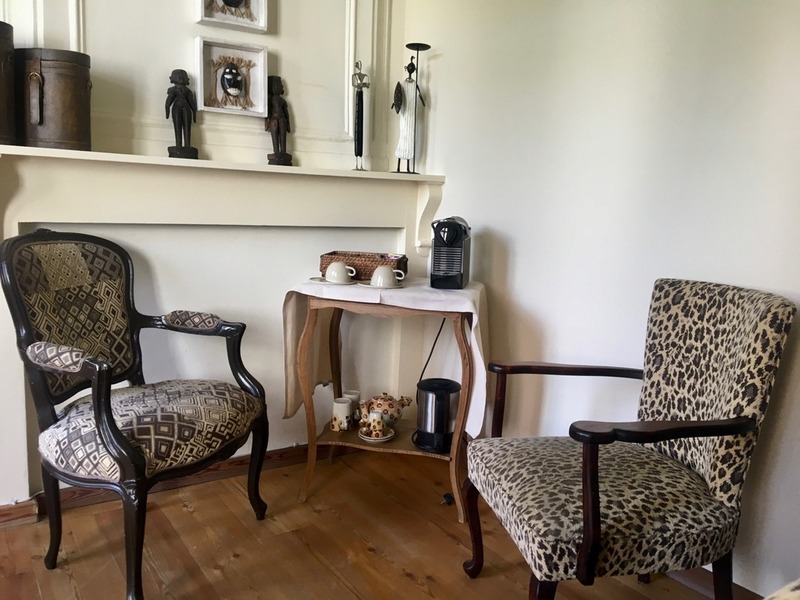 I had an on suite bathroom, an espresso machine plus a selection of teas and a mini fridge, which was great as I was able to keep drinks cold in my room which was much appreciated in the heat wave. The disadvantage is that there are no catering facilities on site and therefore we breakfasted each morning two doors along at the eco friendly, vegetarian Aannaajaanaa, where some of our group were staying, however this proved to be an easy arrangement, plus of course there are plenty of cafes in the locality where you could enjoy a relaxing breakfast. 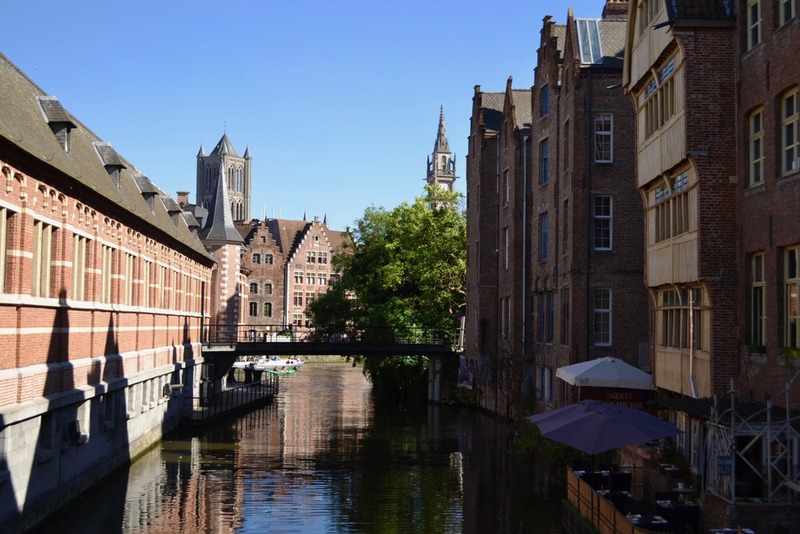 I was immediately struck when I first arrived in the medieval city of Ghent by its pretty cobbled streets and the vibrant life that thrives along the banks of the River Leie, the bustling cafes and shops, and the friendly nature of the people I encountered. It feels like a real working city rather than one, which is just there to cater for the tourists. It’s the perfect town to walk around and take in the sights. 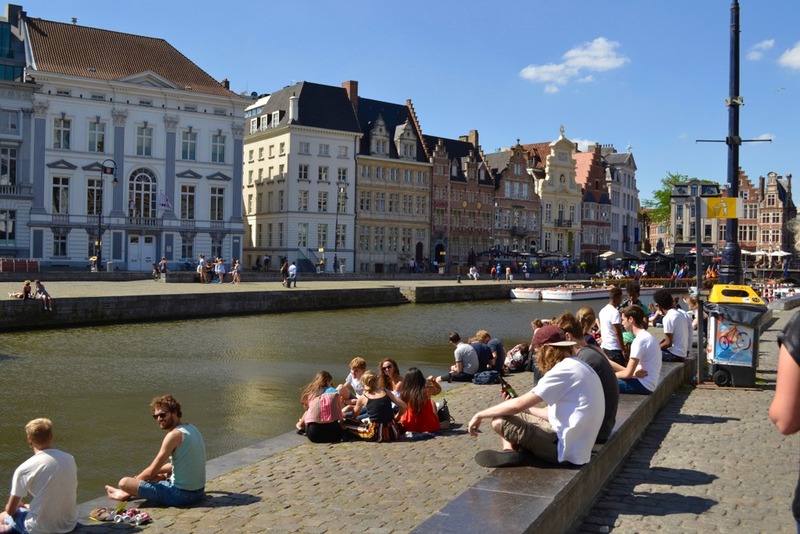 Ghent has a resident population of 235,000, and it is the second largest student town in Belgium after Brussels with 72,000 students. You can’t help when standing on St Michael’s Bridge but be impressed by the dramatic skyline of the three Towers of St Nicholas Church, the Belfort and St Bavo’s Cathedral. 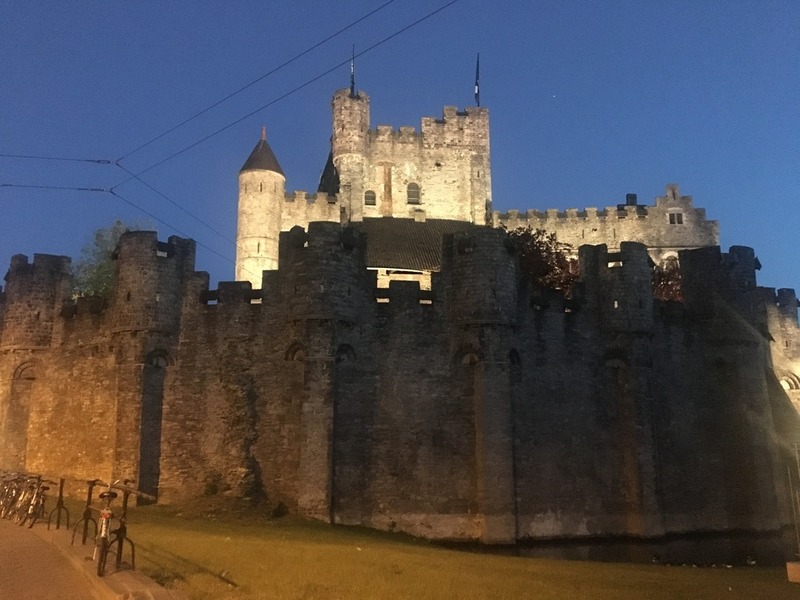 The imposing walls of the 1,000-year-old fortress The Castle of Counts of Flanders, is another landmark, which looks even better when it’s lit up at night. In the centre of Ghent at Saint Veerle Plein, every time a baby is born the lights in the square are turned on. There is a button in every hospital; one can only imagine the joy of the dad’s running to press it to announce the arrival of their child to world. What a lovely touch! 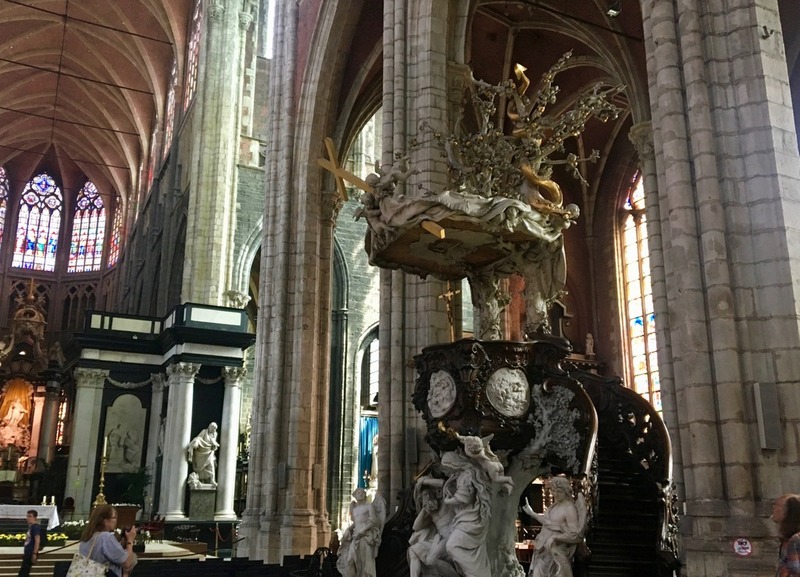 A visit to the historic St Bavo’s Catherdral is a must, founded in the 17th century, and decked in a lavish demonstration of the early Ghentians wealth, in particular the Rococo pulpit. There are many impressive sculptures and walls are hung with a fine collection of art. However the main attraction is Van Eyck’s 1426 altarpiece, known as The Adoration of the Mystic Lamb. It has been called “the most influential painting ever” and “the world’s most coveted masterpiece”. It has also been stolen multiple times; therefore it is displayed behind bulletproof glass with ample security. After a 4 year long restoration it has returned to its former radiant glory and is well worth a visit (free entry with a Ghent City Pass). In April 2017 the city centre became more pedestrianised, you cannot drive through town, and only taxis and special permission vehicles are allowed access. This has not been without problems for the residents but we were told that they are adapting well to the new system. There is large tram network running plus buses (which can only drive at a maximum of 20kl per hour), but what is so wonderful to see is just how many people cycle around the town, and how well equipped the city is for cyclists. There are cycle lanes everywhere you go, the only thing you have to watch out for is the tram lines which can be a little precarious if you get caught in them. Bicycles can be easily hired from around the city. We were provided with a with a City Pass to get around, which I would recommend, they cost 30 euro for 48 hours or 35 euro for 72 hours which includes cycle hire for a day plus all transport, a boat ride and entry into museums and local attractions. 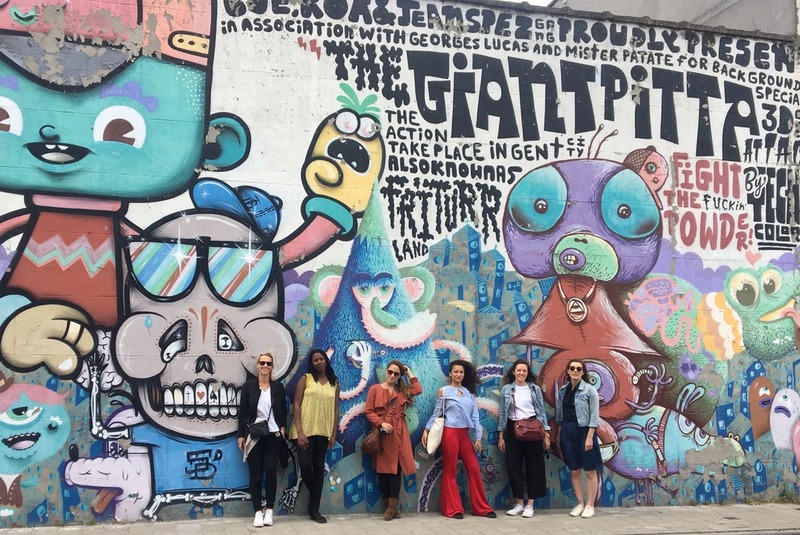 We were taken by our lovely tour guides on a cycle tour around town and out towards the docks, primarily to see the wonderful Street Art which holds a firm place in the heart of Ghent. 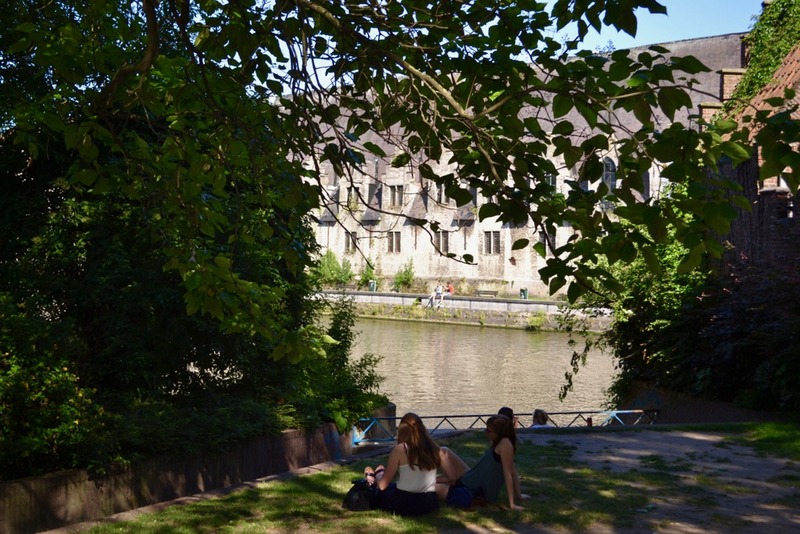 Ghent is a creative city and known in Belgium for its cultural venues and start-up companies. But there is also a less official art scene: the one of street art and graffiti. All over Ghent, you can find walls covered in colours and dramatic looking paintings. 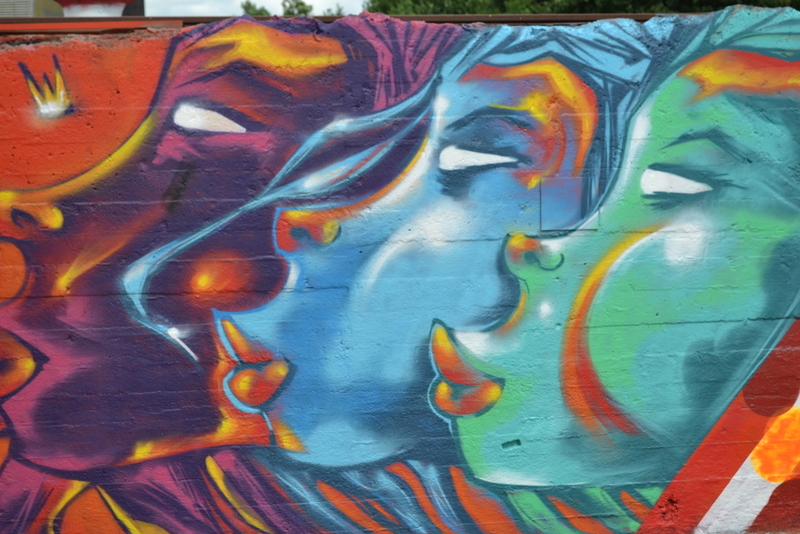 Some works are just tags, others are truly artistic pieces that make you stop to look twice. Street art originally started in the 60’s in New York and Philadelphia, during the 80’s it spread to Paris, Amsterdam, Berlin and then Ghent. Just around the corner from my accommodation is a narrow street called Werregaren Straat, which is better known as Graffiti Street, its appearance is forever changing which is no surprise, given that artists are free to decorate it as they please. Every year Ghent holds a street art festival, and there are many well-known and respected artists in the city. 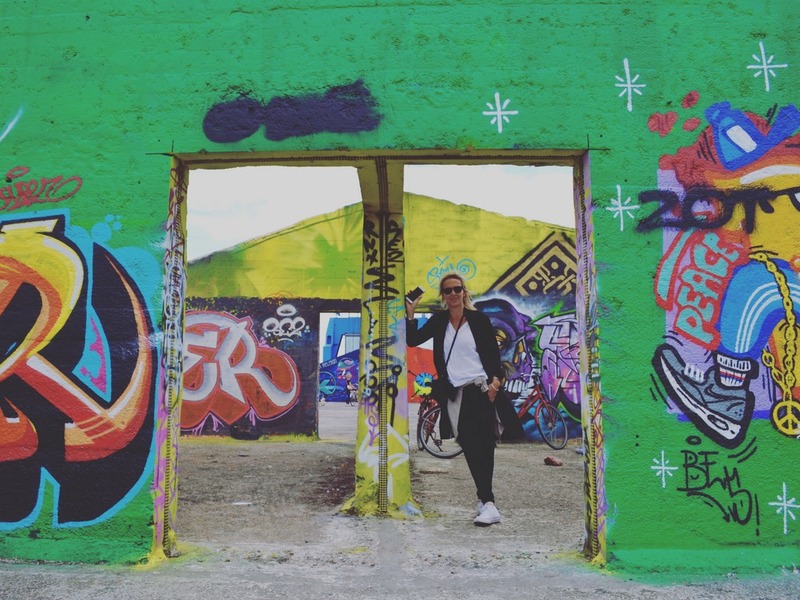 Due to its popularity, in 1995 City Hall decided to provide a street purely dedicated to street art and now people travel from all over the world come to visit the wonderful array of graffiti and street art, which emblazons the city walls. We rode our bikes down Graffiti Street and through the town down to the docks, where alongside the water is a large concrete area which is a street art tolerance zone, 1 of 5 designated areas in the city where people can come and create their own artwork, which dramatically adorns the large stone walls in a suitably urban setting. We then rode past a giant mural, which is called the City Jam. 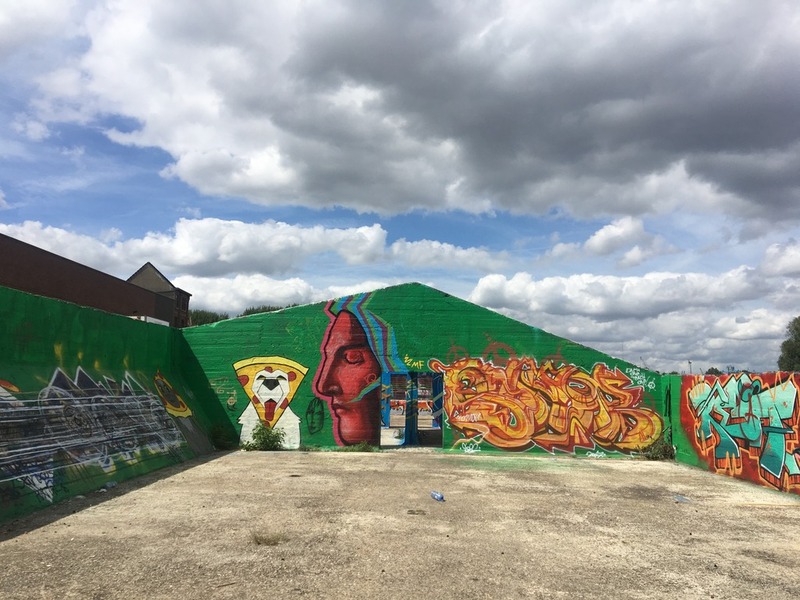 Once a year many of the best street artists come together to create in big mural together. This as you can imagine provided a great photo opportunity! 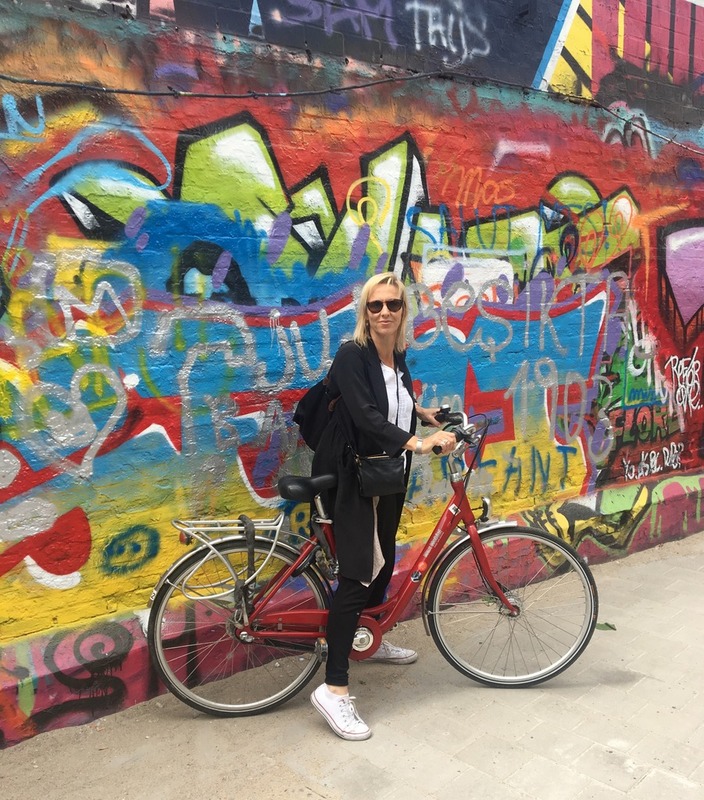 I really enjoyed this part of my trip, especially on a bicycle, as not only do you get to see some inspirational artwork, but also the tour takes you to the areas of the city you might not otherwise go, and I can assure you there are plenty of bars and cafes on route if you are in need of refreshments. 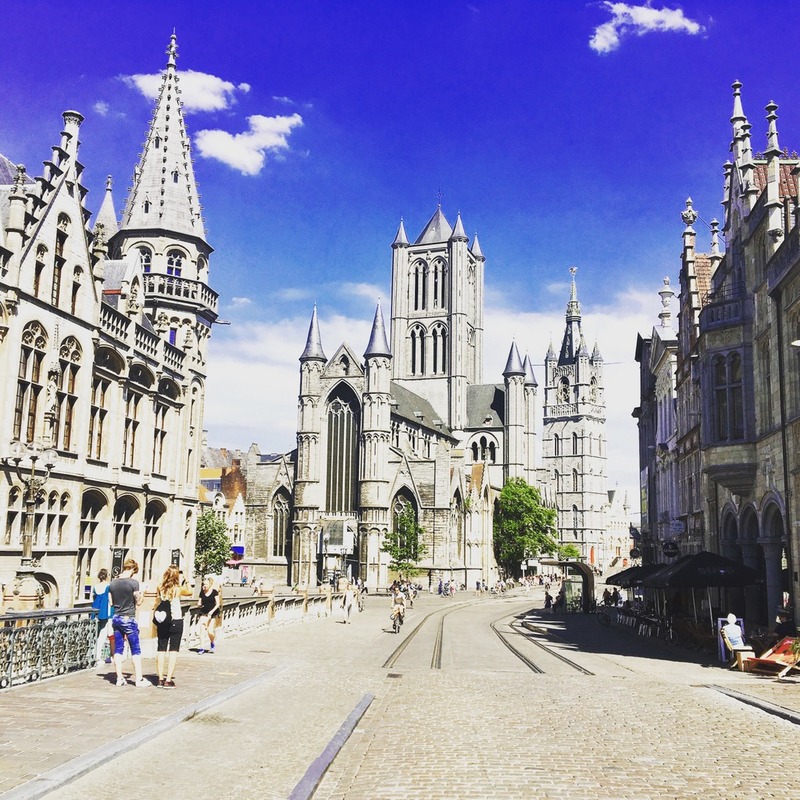 There is so much to see and do in Ghent so with just over 48 hours in town I had to make choices on my final day. I love markets and here there are plenty to go to. On Saturday morning I took a short stroll to the flea market (also open on Fridays and Sundays), the locals were sitting out drinking coffees in the surrounding cafes and the young and old were browsing through the variety of stalls selling clothes, books and bric-a-brac. We also visited The Holy Food Market, which is in a magnificent 16th-century chapel. 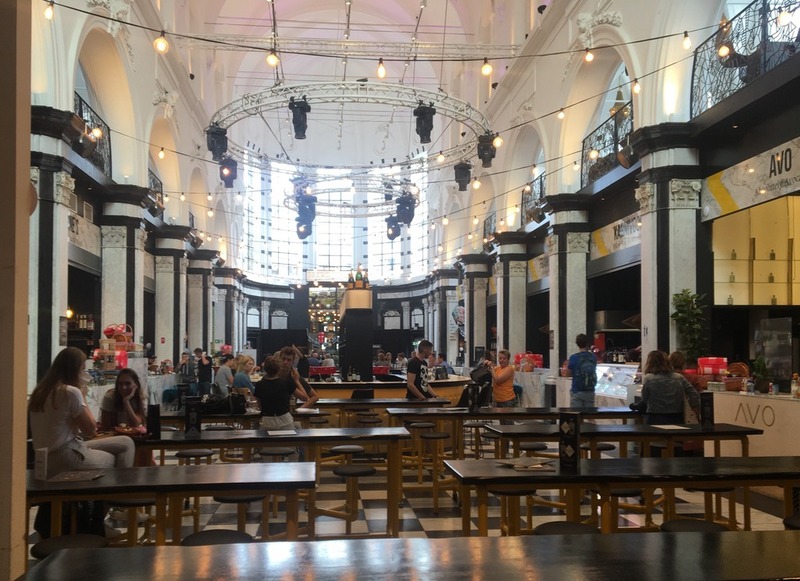 A young man of just 27 years old, decided after visiting other markets around Europe that he wanted to recreate a food market of his own which had a European feel to it but reflected modern life in Ghent. After gaining permission to take over the chapel he painstakingly restored it, and it now offers a fine selection of fabulous food and drink stalls as well as cafes and bars, in a venue that is rather special. It is open every day from 11am-11pm and is extremely popular in the city. I can really understand why. Alternatively, you can do the Sunday market circuit, which offers a variety of different things including, food, small animals and flowers, and I was told that bands often play, and people enjoy sitting out drinking coffee or cava and eating oysters. 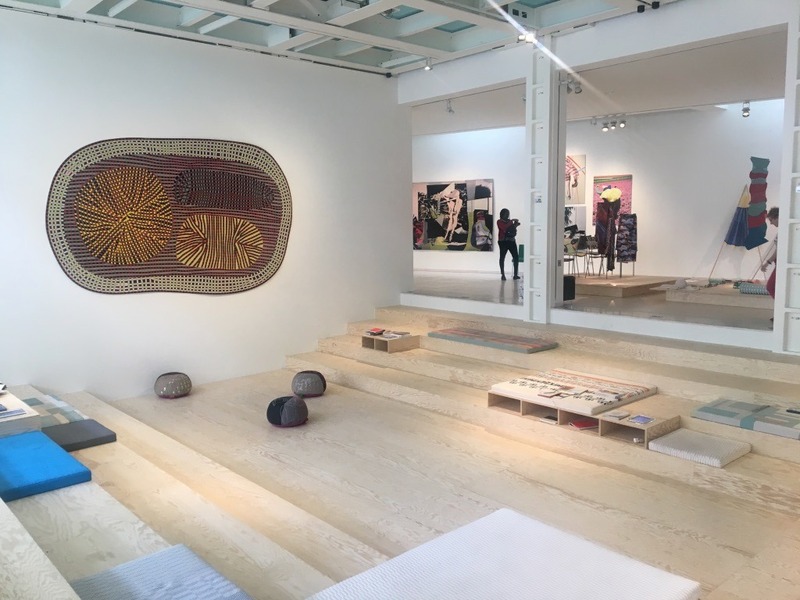 On my final morning I took a stroll I took a stroll along the Graslei and over the river Leie to the Design Museum, which is housed behind an 18th-century façade, inside it is a modern feast for the eyes, a beautiful airy space set over four floors. It has a large collection of 17th- and 18th-century furnishings, as well as examples of Belgian Art Nouveau and Art Deco. 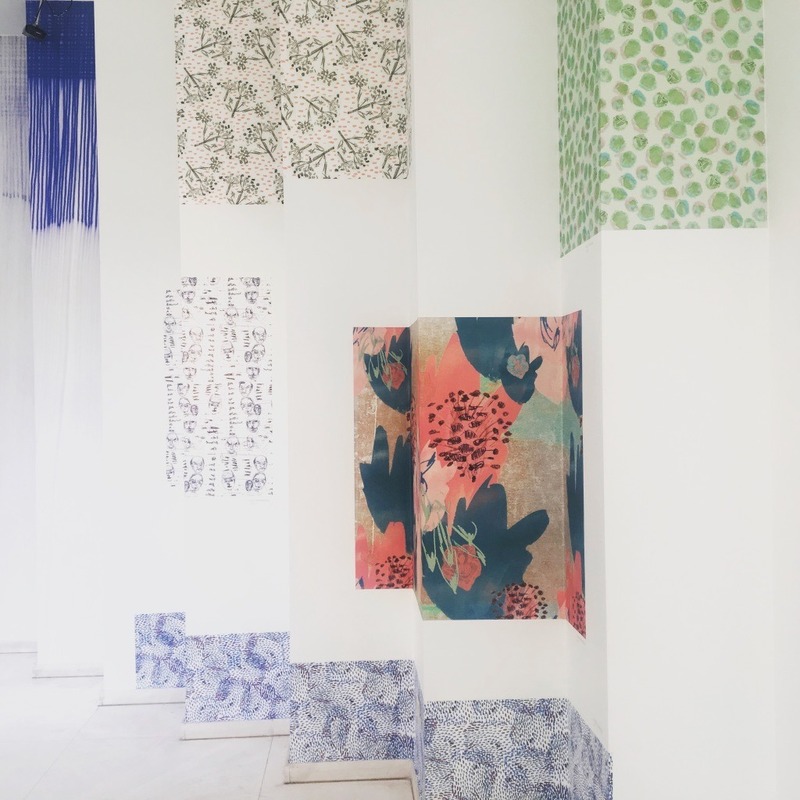 There were also some fabulous contemporary exhibitions, including a textile one that really caught my eye. 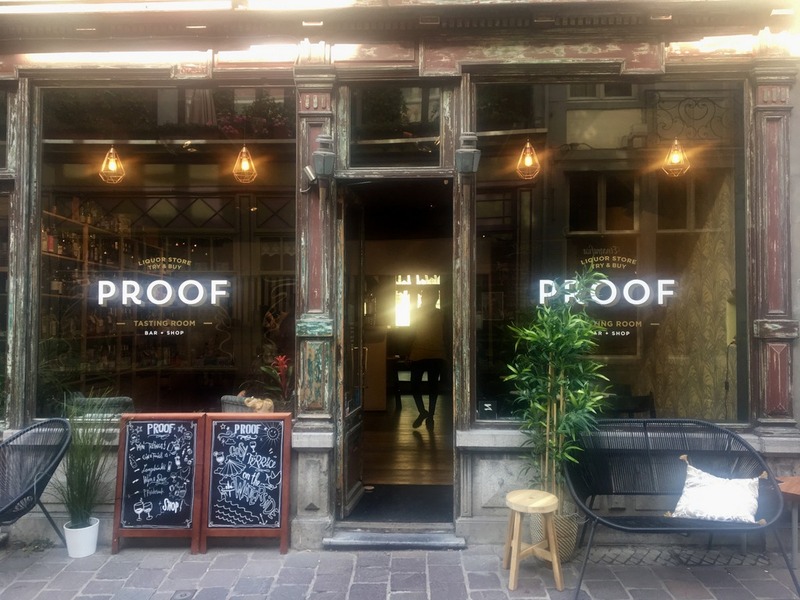 Now although beer has long been famous in Belguim, I was delighted to find a unique shop called PROOF. It has an enormous collection of finely selected spirits, which unusually you can try before you buy, they sell them in 3 different sized brown medicine style bottles with homemade labels. 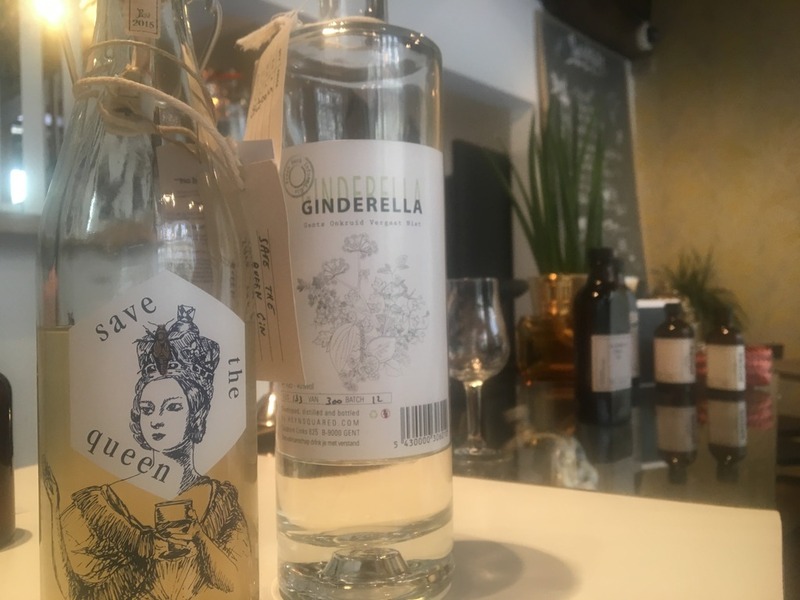 Being a bit of a gin lover I bought a couple of small bottles of different gins to take home, I am pleased to say that I am really enjoying my ‘Save the Queen’, which is made with honey, and the ‘Ginderella’ a local Ghent gin. PROOF is in a wonderfully central location, with the added bonus of a bar at the back of the shop which looks out over on the canal, open daily until 8 pm. They also run a second shop in Ghent called Paleque, which specialises in Latin American spirits, which also has a bar, which is open until midnight. I will have to pay it a visit on next trip! 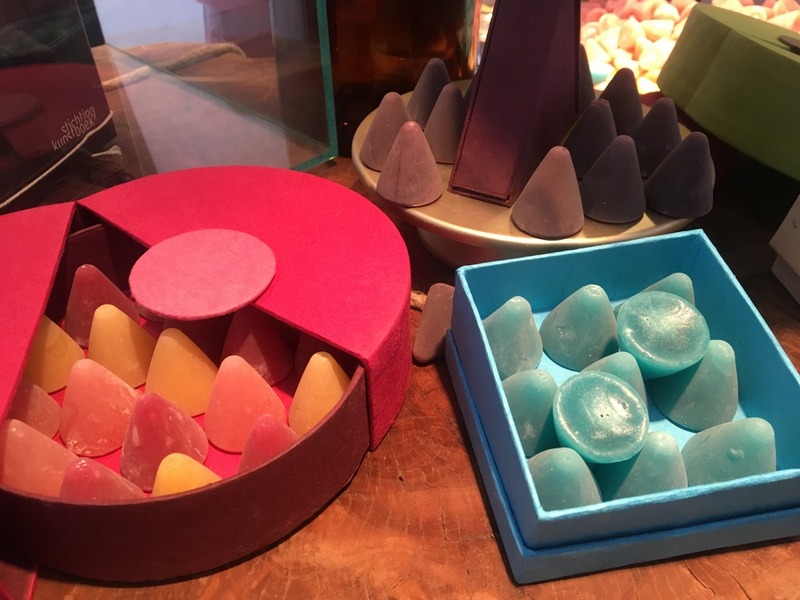 If you want to take home a taste of Ghent I can recommend some traditionally Ghent specialities – for someone with a sweet tooth, you could try the cone shaped jelly sweet called Neuzekes (Noses), which contains a raspberry filling and come in a variety of flavours and colours. 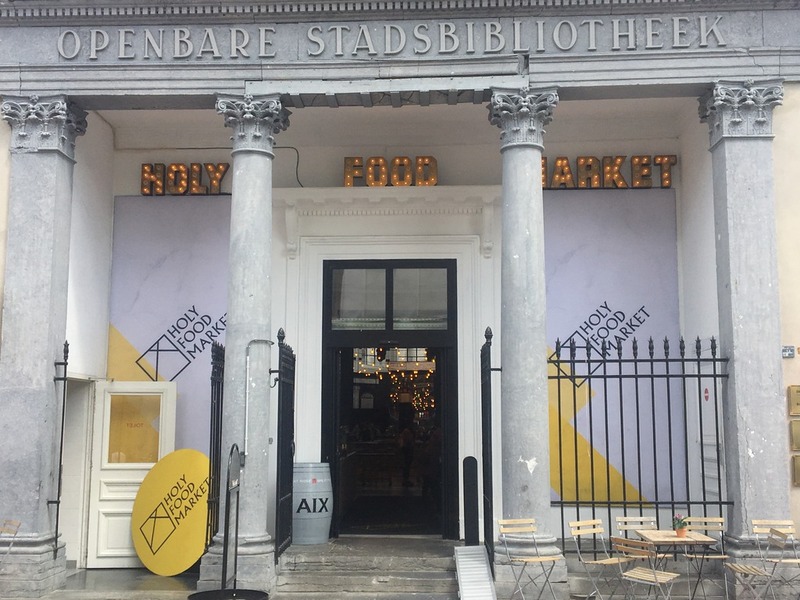 Alternatively, Ghent is known for its wonderful sharp tasting mustards, I found a fabulous shop, which sold all different local mustards, or you could try their traditional aperitif called Roomer, which is made with elderflower. But whatever you do, definitely try and find time to visit this wonderful city, there is plenty to see and do of whether its culture, relaxation, shopping or great food and drink that you’re after. I was lucky enough to enjoy some heavenly summer weather, but I can imagine it would be very special to visit at Christmas time, and with such a short and easy journey direct from the centre of London what’s stopping you. 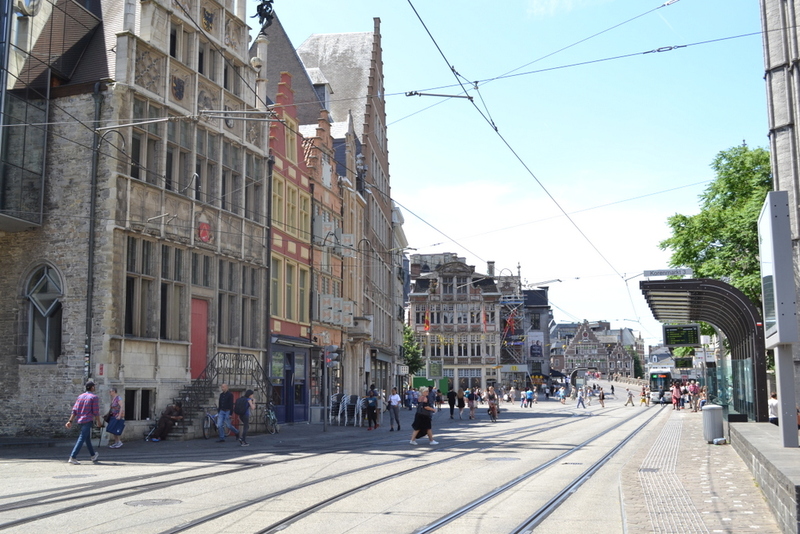 Ghent seems so charming and travelling by train is so much nicer, I need to explore the city. This is SUCH an amazing guide. 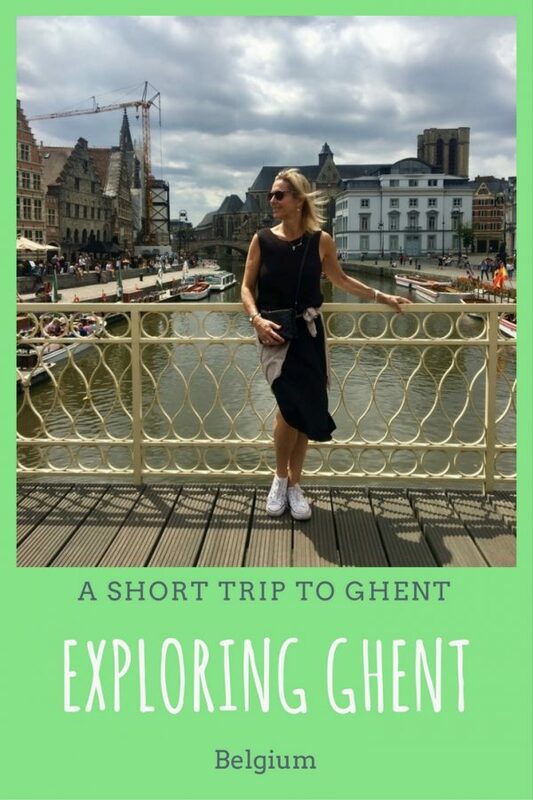 I love Brussels but have been looking to visit Ghent and I can see how doable it is from London. Had no idea they were good for veggies, and I love the rooms too. Bookmarking for later! Wow, what a gorgeous destination! I’ve never been, and I don’t think I’ve ever seen any articles about it before, either. Thank you for sharing all this information and the stunning photos!